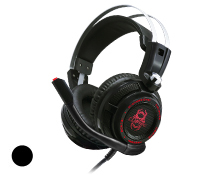 CLiPtec BGH731 LED Illuminated Vibration Gaming Headset - Zambeos is the professional over-head gaming headset for the elite e-sports player or any gamer seeking a pro-audio gaming experience. Featuring with Active Bass Vibration Technology (ABNT), the rich bass sound will immerse you in the game like never before. 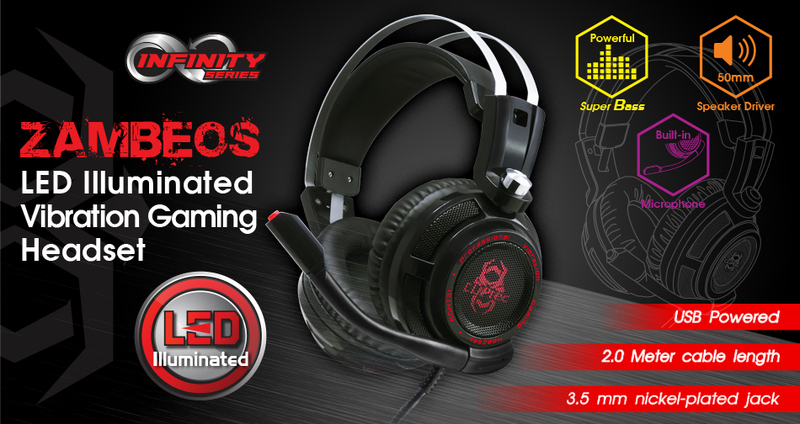 With full-sized 50mm premium speakers driver bring out every detail in the game so you can react quickly, powerful bass for completely undivided in-game focus. 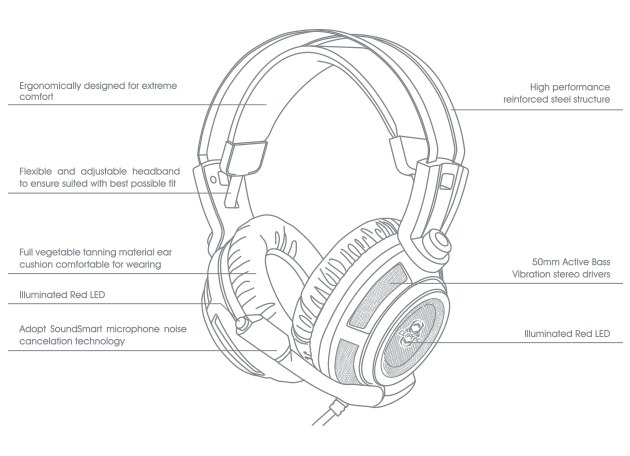 Its reinforced structural housing provides the frameworks for a super comfortable build, with ergonomic headband and ear cushions. Prefect for gaming, music playback and movie. In addition, glaring LED illuminated breathing light highlights the atmosphere of the game and reaches to an enjoyment climax. Flexible microphone for exact positioning, and microphone with great sensitivity at picking up sounds and for live in-game chat. Adjust the volume in a second. Audio controls are located on the perfect position will always within reach. Glaring illuminated LED with breathing style are designed on the ear cups, highlighting the atmosphere of the game. 2.0M strong performance wire, durable tensile effectively reduce the external resistance. The Over-Ear ear muffs use PU leather, and stuffed with sponge inside, absolutely skin-friendly texture, is adjustable and soft on your head, very comfy and breathable for yours ears. Two Nickel-Plated 3.5mm jack plug for the audio and microphone. Standard USB plug is compatible with any output decive with USB port such as, Desktop, Notebook or even portable charger for the LED of the headset.